The odorous house ant is brown to shiny black. The workers range in size between 2.5 to 3.5 mm long. Their name comes from the very strong odor omitted when they are crushed, which can smell like rotten coconuts. The odorous house ant is native to Florida and many other parts of the United States. The odorous house ant prefers to build nests in the shallow earth under rocks, wood, mulch and a wide variety of debris. Odorous house ants like to nest near moist or damp areas when inside residential homes. If odorous house ants are introduced indoors, they can be found in wall voids, floor voids, around water pipes and heaters. Although most colonies are small, odorous house ants can develop into very large colonies with over 10,000 workers and hundreds of queens. The winged reproductive ants can be seen flying around Florida from May through July. Once mating season is over, the female sheds her wings and begins to lay her eggs in a protected area. Odorous house ants are considered tough ants that are hard to eradicate. Injured workers will keep working with severed limbs and crushed body parts. Queens with crushed abdomens will actually keep laying fertile eggs and resume duties as normal. Odorous house ants prefer sweets but will consume live or dead insects. Studies show these ants will always prefer sweet baits to any other type of bait. They prefer to feed on honeydew, flowers and nectars. The odorous house ants sweet tooth is what initially drives this ant into residential homes, searching for a sweet snack. 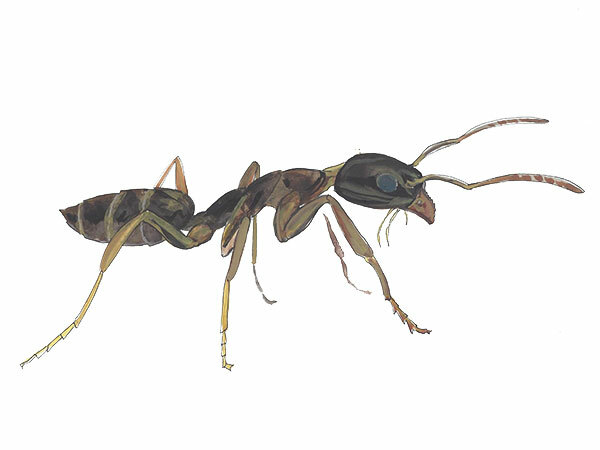 When searching for food, foraging ants will trail along branches, foundations and sidewalks. Pest control for the odorous house ant is highly successful with the use of sweet baits. Slow acting bait is recommended in order to reach the queen and the rest of the colony members. Place the bait in a heavily trafficked area by the ant, preferably in the middle of the foraging trails. Replace the bait once it has been consumed and check it regularly to make sure they are still consuming it. Be patient – baiting my take several weeks to show signs of results. If the nest is easily accessible, residual insecticides are also effective. Inject a small amount in the nest area and follow by an outside perimeter treatment. Warning: Pesticide is poisonous and should be handled by a pest control professional. Always read the label and follow instructions before use. We make ant control easy. We service Manatee county and Sarasota county for all ant problems. Call the ant control experts today for a free inspection. You dont have to share your home or business with ants!